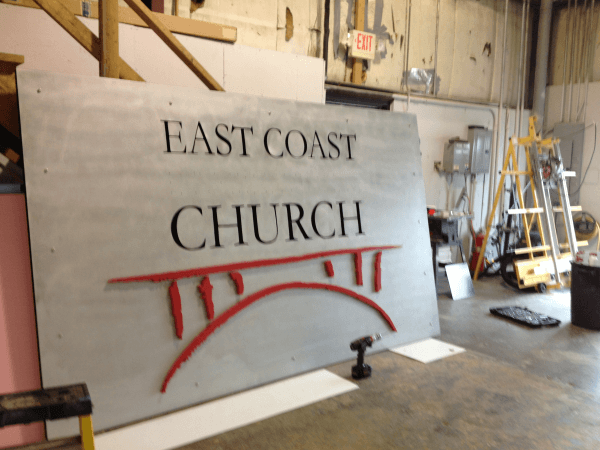 A customer recently came to us looking to create an Exterior Dimensional Metal sign for their church. Not a standard dimensional sign, but something with an industrial look to fit into the environment where they were located. They had a vision of what the sign would look like, but were not sure exactly how it would come together. We started with a conversation and some photos of signs they had seen that they felt were what they were looking for. From there, I began with some drawings and a couple of conversations. We worked out some kinks on how the sign would be hung, what materials would work best for the project and after several designs and changes, we determined a final design for the sign. At this point, our installer went on location and did a survey to be sure the building facade would support our sign design and understand how we would install it. Once it was determined that the installation site was appropriate for the design, we moved forward with obtaining a Sign Permit. Providing drawings and information to the city was crucial to obtaining the permit as this sign hung over a public sidewalk. 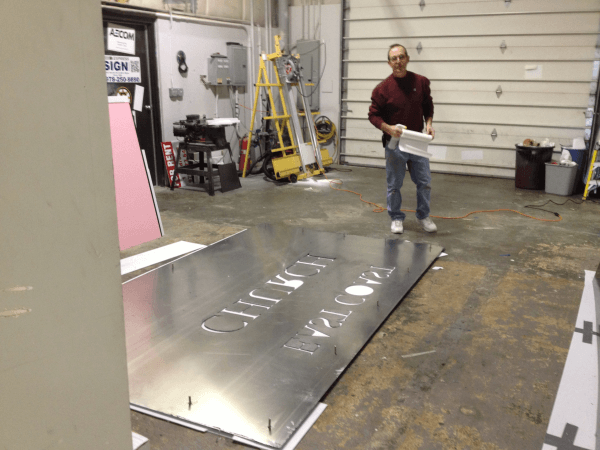 The Sign Permit was approved and we moved on to the fabrication of the sign. 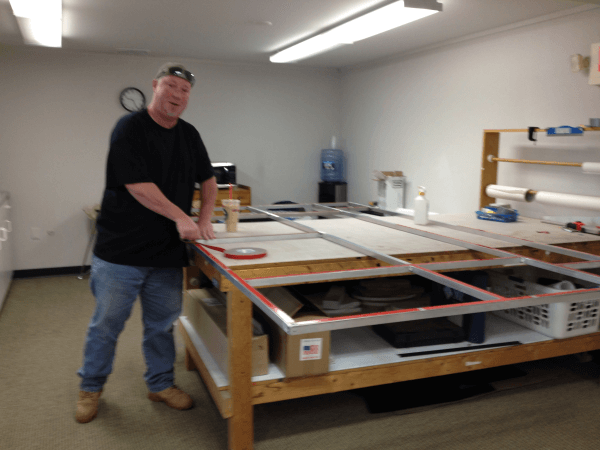 Our next step was to source our materials, arrange for the routing and painting of the panel. This proved to be a small challenge simply due to the size of the panel at 10′ x 6′. The client wanted the panel to have an aged effect so we determined the best method get that effect. Using heavy chains to mark up the panel was the first step. From here, paint was applied and removed to give an aged effect to the panel. Being a very custom finish, it to a couple of go rounds to get the final effect needed. Our next step was to fabricate a frame. The custom frame would support the back and front of the sign and prevent the center from bowing. Again, due to the overall size of the sign, careful consideration had to be made on what material would best support the sign with the least amount of weight. The idea was to create an opening or separation between the back and front of the sign so that the letters seemed to be cut out and see through on certain parts. Some careful planning at this stage was needed to be sure that when we sandwiched the three pieces together it was perfectly square. As always, the team put plenty of planning into the project. Installation of the dimensional letters came next. Using a drill pattern, holes were made for mounting the letters using studs the letters were then applied using silicone for additional adhesion. The final stage was to apply the custom fabricated screw covers to mimick the look of standoffs. Final Assembly! The finished product came out just as I had imagined when we started the project. Now for the installation. 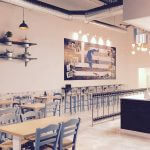 Due to careful planning and a site survey the installation went off without a hitch. 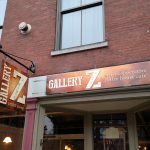 The client was very happy with the final outcome a structurally sound, Dimensional Exterior sign that would last for years and met their design expectations. 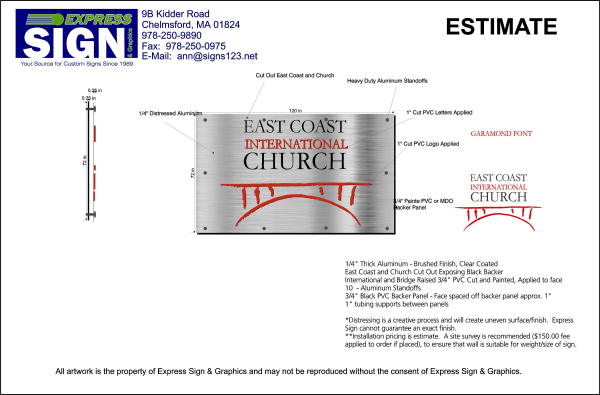 Do you have a great idea for a sign, but your not sure how to pull it off? Give us a call. 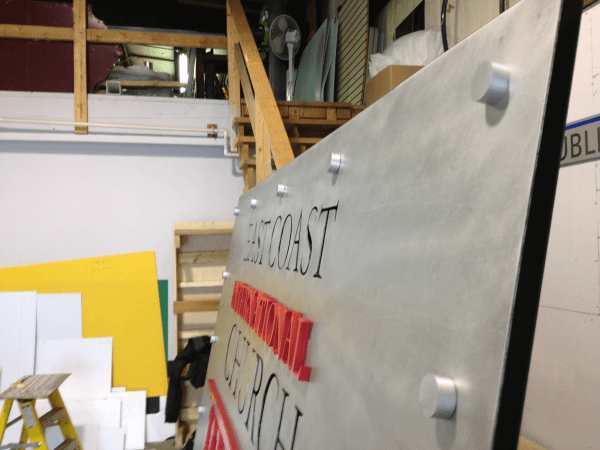 Our dedicated team of professionals will help you to design and fabricate your sign project. 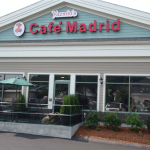 We are experienced at creating durable exterior signs that are attractive and effective.